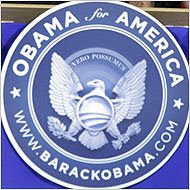 Young BHO has orated from a lectern decorated with the pseudo-seal on the left. It is the color of Wedgwood. The non-messianic blogosphre is agog. If one were to remark that the bird is a Popeye's fried chicken and the sphere a watermelon, all Hell could break loose. It's GOOD to be the Messiah, but it can be hard. NB: ἀσκέσις means "practice, training, or exercise," as by an athlete. Marriage, thus, is just as much a spiritual journey as monasticism! Here, on the successful landing of the Phoenix Mars lander. This is an amazing achievement. Who cares of one of Barack's ex-minions got a sweetheart loan from Countrywide? An airbus in Khartoum skidded off the runway and burst into flames. Many escaped, but dozens burned to death. I just listened to Hillary's concession speech. She didn't say anything a loyal Democrat wouldn't say on such an occasion, but she makes my gorge rise. I just can't stand her pieties, her identity politics, her nasality, and her nostrums. I notice that Chelsea approached, Bill got a peck, but as they walked off, he was the runt, sucking the hind teat. How long will that marriage last? And who's going to pay the $20 million debt? There's something painfully ironic about Pfleger's (if temporary) ouster. He's been thumbing his nose at authority -- secular and sacred -- for years in pursuit of what he believes God has called him to do: fight for the poor and the oppressed; battle injustice in whatever form it appears, be it racism, sexism, or classicism; and to above all present the God of revolutionary love and radical grace to the world around him. That sometimes has meant disobeying civil and canon law. Gotta watch out for those Greek scholars. Give 'em an inch and they'll take a mile.